Bordeaux: journalists chased out of square by ‘yellow vests’ More here… Rouen: ‘yellow vests’ clash with cops…Banque de France door torched (video)…Montpellier: railtrack blockaded…Toulouse: burning barricades…Nimes: demo outside main police station This is an over-simplified take on the movement (e.g. minimising any critique of flag-waving or the singing of the Marseillaise), but interesting. Zimbabwe, Chiredzi: cops kill man during clashes with villagers – Merry Christmas! Tunisia, Kasserine: further clashes following journalist’s death by self-immolation…clashes also in Foussana, Tebourba & Jebaniana “Clashes between protesters and police began again yesterday afternoon in downtown Kasserine. Young people from the Ezzouhour city set fire to tires blocking several alleys and threw stones at police who used tear gas to disperse them. In addition, units of the National Guard of Foussana in Kasserine, intervened in the night from Tuesday to Wednesday, to disperse nearly 70 people, in front of the district of the security institution of the region. According to Colonel Houssem Jbebli, the intervention units used tear gas after people threw stones and Molotov cocktails at the district headquarters. In Tebourba (La Manouba), young people burned tires and blocked traffic. They also attacked a train that they damaged.” More here in English “No one can deny today that all the leaders of this country are responsible, responsible for the distress of our youth, their despair and their frustration.” And not just in Tunisia, but everywhere across the world. As you probably know, the Halles de Rungis site has for several weeks been subjected to filter blockades at the main access gate, the Thias Gate. Taking my courage in both hands, braving the wind and rain, I got up at 4 am, took the subway, then the bus, and after a depressing more than 1 hour trip to the industrial areas south of Paris, I found myself facing dozens of yellow vests that filter the entrance, just to take the temperature of the apparent “blockade” myself. 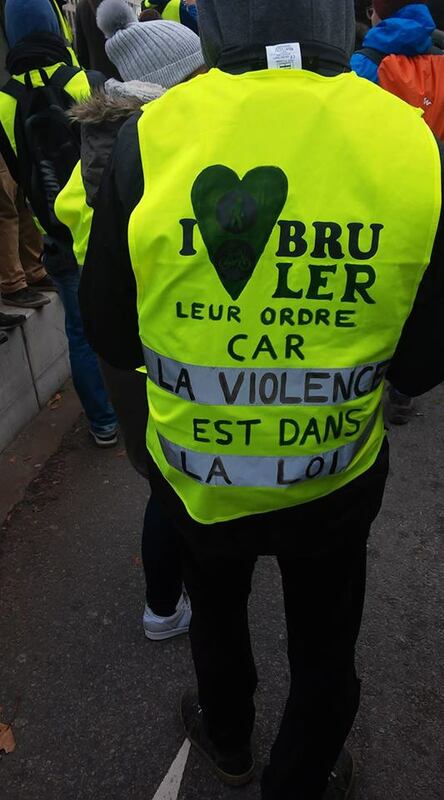 I already had some suspicions, given the interviews conducted, about the content and purpose of these brilliant “direct actions” (says “Paris Lutte Info”). But I admit, in all modesty, that the atmosphere exceeded all my expectations. I was faced with bands of vulgar nationalist nags, both sexes, one of whom was from the French West Indies and accepted because he “was French too”: “We are not racist”, proudly affirmed the leader of the group… They were there, in their words, “to save French peasants and traders” from the “unfair competition” “organized by the Europe of bankers represented by Macron”. After a few attempts at awkward approaches and some attempts to get me to wear the famous yellow uniform, which I refused with a lot of courtesy (for fear of maybe getting my face broken), I innocently asked the question: “Which bank is Macron the representative of?”. I was told by the leader, with strong nods from her acolytes: “Well, the Rothschild bank, of course.” I therefore focused on the eminently revolutionary nature of their opposition to finance capital, which, as is well known, has been in the hands of rabbis since time immemorial. To expand somewhat on the scope of this communication that had begun so well, I timidly evoked the role of Macron’s brilliant second-in-command, the so-called Philippe whose origins are not from the banks but from nuclear power – in this case, Areva . To which the chief replied that she did not care and that besides she was a partisan of French nuclear power and hostile to all the “Parisian bohemian bourgeois ecologists who want to deprive us of electricity.” A position which was so typically popular it was also shared by her groupies. 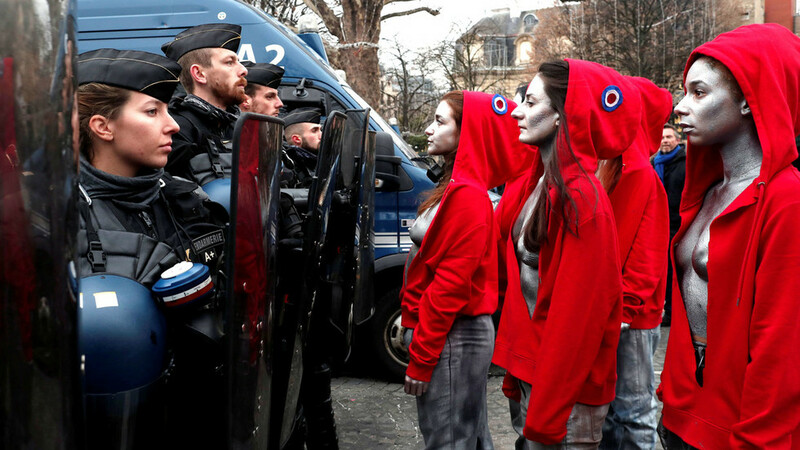 I began to feel somewhat lonely and tried to reach a conclusion, before clearing off, about these interesting modes of “direct action” that “Paris Lutte Info” had loudly proclaimed. I was not disappointed: these remarkable saboteurs of “European trade” had first filtered exclusively foreign trucks for 30 minutes, and then very soon after, for the sake of justice probably, French trucks for 15 minutes and then foreign trucks for 45 minutes. They did not even realize that, because of the European agreement, French trucks can carry foreign goods and vice versa. In the final moment of my visit, their last exploit consisted of delaying for almost three hours one of the Spanish trucks, threatening the driver, who was transporting oysters, French molluscs in fact, from Oleron to Rungis. Which led the Rungis wholesaler to throw them in the bin. No comment. Should be pointed out that the media is saying that the less participation there is in these situations the more the ultra-right take prominence. Hard to know how much this is true, how much this is a self-fulfilling media strategy – intended or not. Certainly on December 22nd at Sacre Coeur (built explicitly against the Paris Commune in the 1870s) there were Nazis openly displaying their anti-semitic etc. agenda, complete with gas chamber denial. UK, Oxford: pseudo-rebels occupy shopping centre complaining about environmental destruction See entry for 17/11 for a critique of this organisation.They quote David Attenborough without the slightest irony – even Monbiot is able to criticise him. For a better critique, see this. 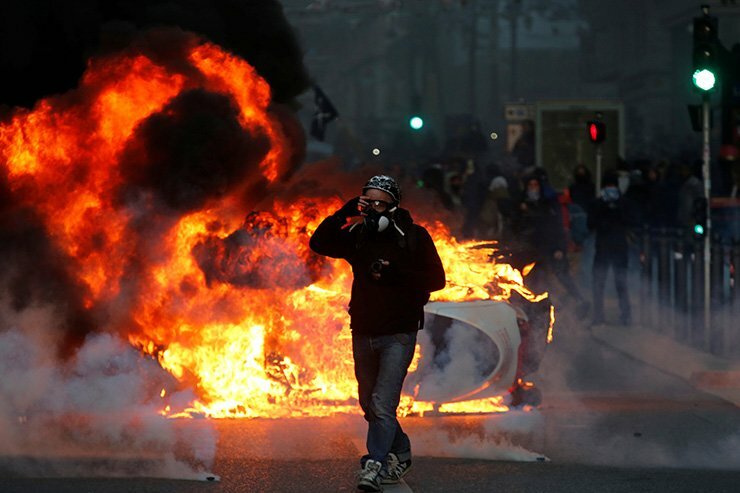 Chile: Valparaiso dockers strike spreads to other ports “Protests spread briefly to several other ports overnight on Monday…the Chilean police had raided union offices in Valparaiso to tame protests late on Monday after about 20 people were seen throwing Molotov cocktails from its roof….Local daily newspaper El Mercurio reported on Tuesday that the strike had caused fruit exports from Valparaiso to fall by 95 percent from the same period last year” See also report for 14/12/18 below. 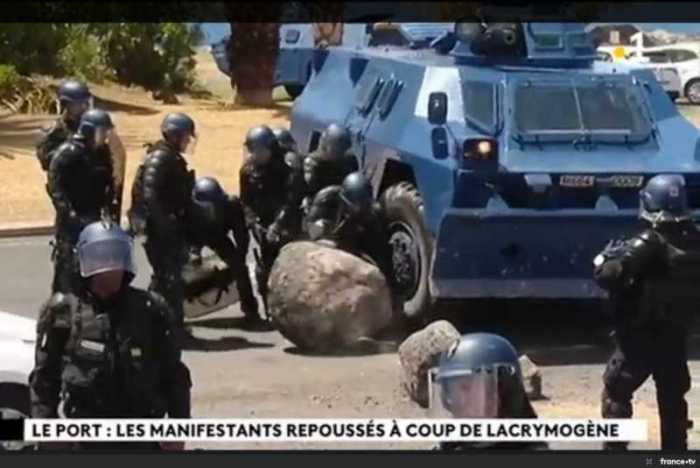 France, Guadeloupe: high school students block roads, attack cops with stones, home-made ‘bombs’, burn bins…Report on high school clashes here over the last 3 days…report on strikes called by unions throughout France For a critique of the CGT union see this. You’re waiting for the Revolution! Granted ! Mine began a long time ago! 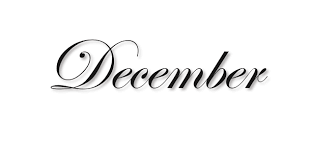 When you are ready – God, what a long wait! – I won’t feel disgusted by going a little of the way with you! But when you stop, I will continue my mad and triumphal march towards the great and sublime conquest of Nothingness! Every Society you build will have its margins and at the margins of every Society will roam the heroic and bohemian vagrants, virgin and savage thoughts that can only live by preparing new and formidable rebel explosions! And I will be among them. Pretty words – there must not be more than words. I do not want to run behind the masses. It is said that this time it is the real thing, that the insurrection has arrived … Mine arrived a long time ago and it is an individual revolt. 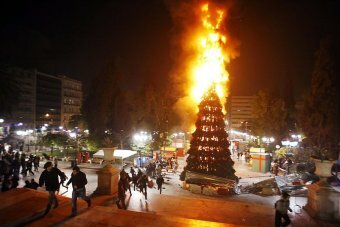 In the early hours of December 11th I set fire to six of the cars belonging to Paris’ Town Hall , rue Corvisart (13th). It was not the Socialist Party specifically that was targeted, any more than Macron or any other. All powers have to be destroyed. In order not to forget the companions who have left us. For Mikhail, Zak, Sebastian, Mauricio, Alexis and all the others. For those who are in prison. One thought in particular for Krème and the defendants of the case of Scripta Manent in Italy. Jordan, Amman: riot No explanation or context for this riot, but probably an anti-austerity riot. 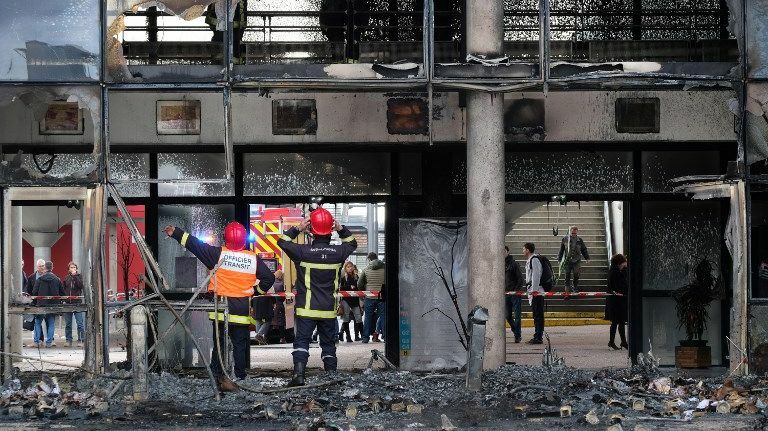 Germany, Bamberg: riot and arson in migrant detention centre “…damage is estimated at about 100,000 euros…Security service personnel who were exposed to disturbances were attacked by residents of the…center. As a result, the situation escalated: several men barricaded themselves in the facility. First incoming police were pelted with paving stones. There was a fire. France, Herault: disturbances outside high schools in 5 towns in this county …Nimes …Lyon… Mulhouse: masked motorcyclist deliberately runs down cop at high school blockade…clashes at high school student demos in 35 towns… armoured cars to be deployed in Paris “A government official said 89,000 police and gendarmes would be mobilised across the country, 8,000 of them in the French capital, alongside a dozen VBRG armoured vehicles….Staff at the Bastille Opéra were reported to have locked the orchestra’s instruments somewhere safe fearing an assault on the building.” There have been calls for people to arm themselves against the state, others are hoping to occupy the Elysée Palace tomorrow. But before you get all excited, the probability is that these calls are coming from the ultra-right…or maybe sections of the state trying to frighten people away from Paris for fear of people starting shooting all over the place. A strange atmosphere, not easy to get to grips with either emotionally or intellectually, and not at all like the more lighthearted, and more clearly class-conscious, epoch of the anti-CPE movement of 2006. Eire, Dublin: occupation of Department of Communications, Climate Action & Environment for 2 hours The activist mentality is drawn to such gesture politics because it makes them feel that they’ve done something without really doing anything other than show their need to plea to the State to do something which if the State ever does will invariably be worse than useless for the vast majority. But at least it helps them feel good and pure and maybe gives them an anecdote to tell people. 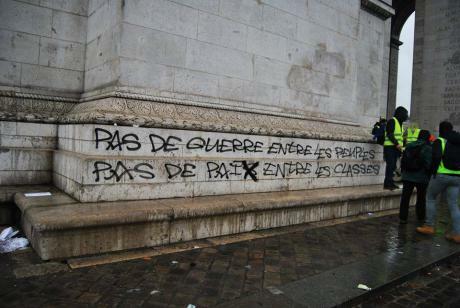 France: clashes between high school students and cops in 22 towns…blockade of 2 Paris universities. This is a more balanced take on the situation than most texts, though not uncriticisable (what is?). 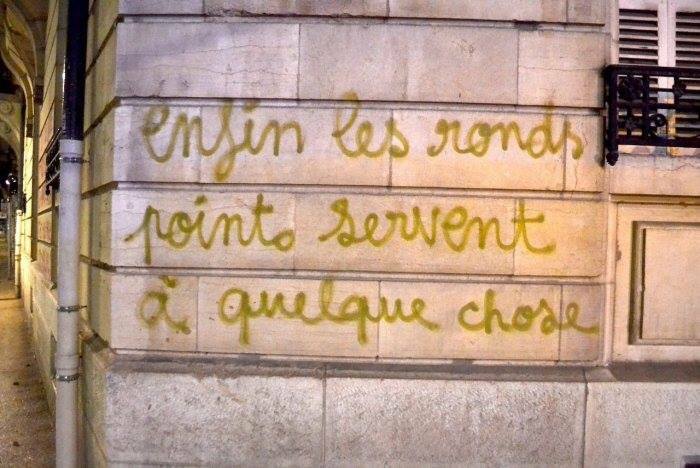 In France, there are principally 2 tendencies amongst those who claim to want a revolution: those who tend to opportunistically over-emphasise the radical aspects of what’s happening and those, partly in reaction to this tendency, who tend to exaggerate the bad aspects. We live in confusing times and trying to unravel this confusion is not helped by trying constantly to impose more classical proletarian ways of thinking and categories onto a movement that involves lots people who have never confronted this society before. People are trying to break out of their isolated individualist responses to intensified misery by trying to come together but with a whole load of other baggage from the past and present of this society colonising their brains and habitual discourse. These people have lived through a period of intensified ignorance of the contradictions and obstacles we have to confront and trying to help ourselves and them clarify the significant changes in both the composition and consciousness of ‘the working class’ will be part of overcoming such ignorance. Which involves neither opportunist cheer-leading demagogy involving intellectual contortionism of the most spurious kind nor impotent laments that the course of class struggle is not running smoothly according to notions developed through over a hundred years of previous movements This epoch could lead to a kind of totalitarianism very far from classical fascism (though reflecting aspects of it) or to a genuinely subversive movement with the potential to create serious problems for all forms of capital, not just the current neoliberal form. Remaining content to merely comment on these tendencies will inevitably ensure the victory of the former. Tunisia, Sidi Bouzid: clashes between tyre-burning youths and cops No clear reason given for this. 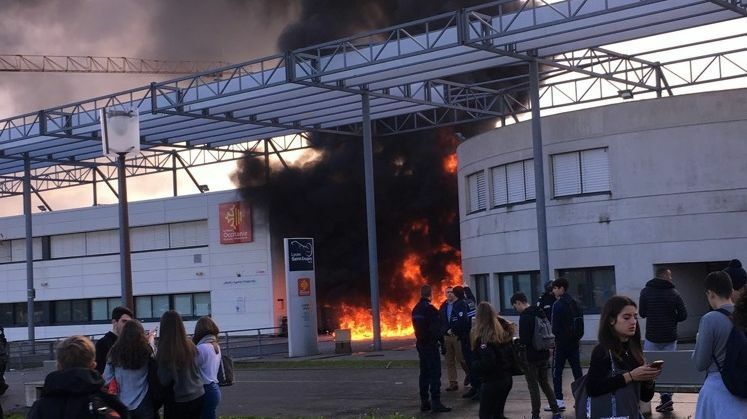 Bins and pallets burning in Blagnac, where the fire spread to the entrance of Saint-Exupéry high school and caused significant damage to the project of conditioning that goes under the absurd name of ‘education’. The high school closed for 48 hours for ‘security’. 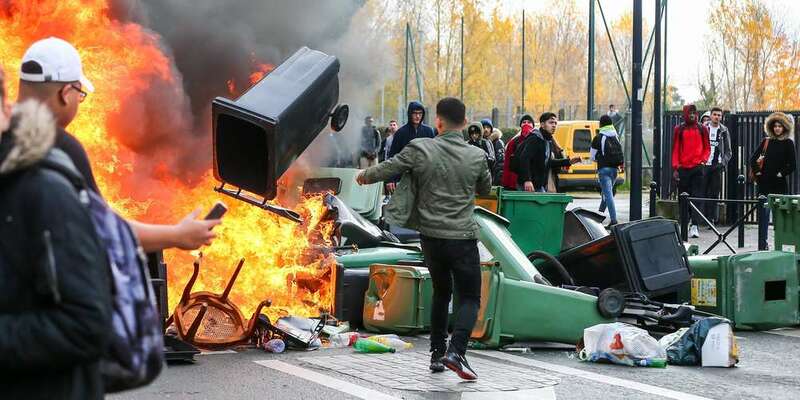 24 schools in Toulouse were blockaded, amongst which a dozen were blockaded with burning bins and pallets. A young demonstrator was seriously wounded in the face by a flashball. 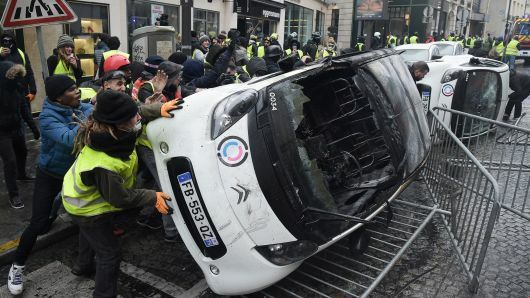 France, Paris: far left and far right clash with cops in ‘yellow vest’ protests…lots of luxury cars & cop car torched; also a restaurant… More here “…masked protesters fought running battles with police, torched cars, set fires to banks and houses, and burned makeshift barricades on the edges of demonstrations against fuel tax. 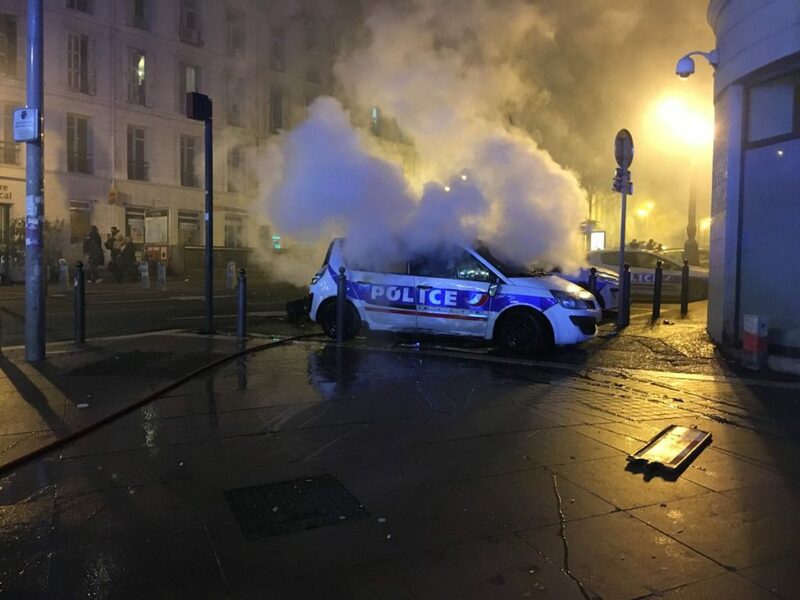 Near the Arc de Triomphe, one of Paris’s best-known monuments, masked men burned barricades, set fire to buildings, smashed fences and torched luxury cars on some of the most expensive streets in the city as riot police fired teargas and water cannon. Then, by early evening, rioters spread around Paris in a game of cat and mouse with police. Luxury department stores on Boulevard Haussmann were evacuated as cars were set alight and windows smashed. Near the Louvre, metal grilles were ripped down at the Tuileries Garden where fires were started. 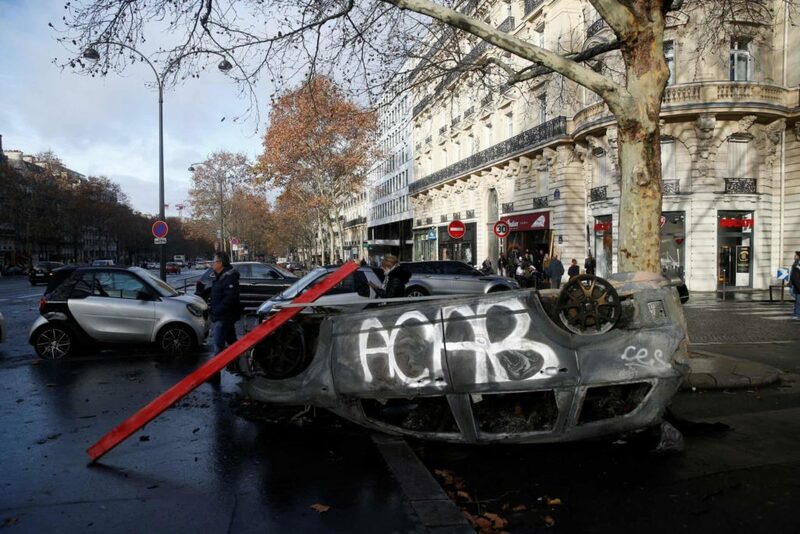 On the Place Vendôme, a hub of luxury jewellery shops and designer stores, rioters smashed windows and built barricades….Anti-Macron graffiti was scrawled over the Arc de Triomphe near the tomb of the unknown soldier and protesters burst into the monument smashing up its lower floors before climbing on to the roof. 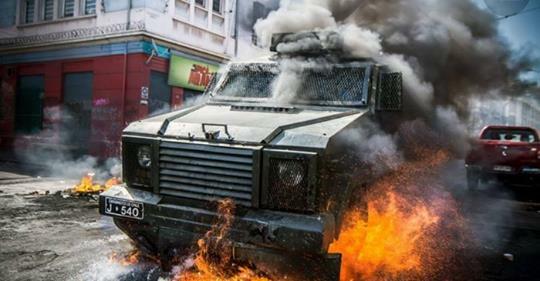 More than 250 people were arrested and at least 100 injured – including one protester who was in a serious condition on Saturday night…” It was later revealed that the cops ran out of teargas. and cry and cry and laugh about it all again: a smashed statue of Marianne, symbol of the French Republic, inside the Arc de Triomphe (some suggest that this may have been done by right-wing monarchists, but given that there were all different strands of the political spectrum, including anarchists & ultra-leftists, round the Arc de Triomphe, this is pure speculation). 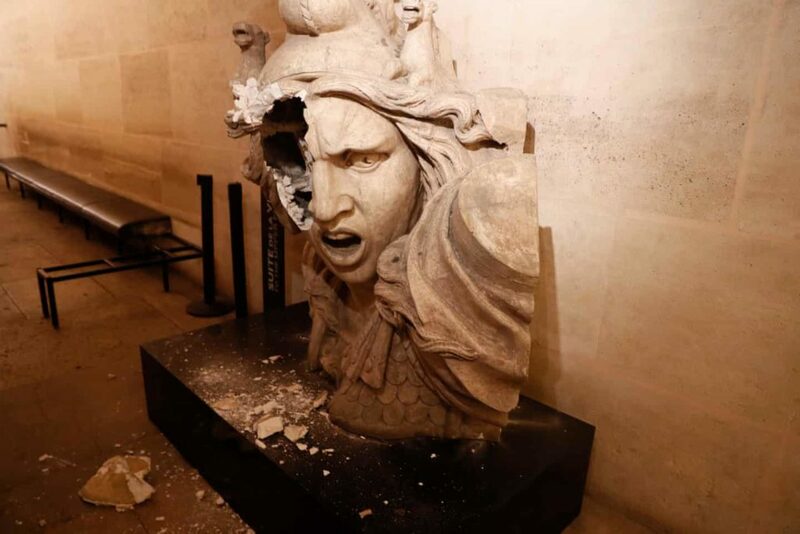 Protesters smashed other statues in the monument and destroyed the gift shop…On the other hand, some ‘yellow vests’ protected the tomb of the unknown soldier – a symbol of militarism – from those who wanted to attack it. Can all this seriously be simply reduced to just petit-bourgeois populism and nothing but? This is not to underestimate the growth of ultra-right populism, but it’s clear that there’s a lot more to what’s happening in France than just that. It’s a weird difficult-to categorise mix of people…Possible state of emergency to be declared. The government has asked all the other main political parties to have a meeting with them. Marine Le Pen asked Macron if he wanted to be the first president of the 5th Republic that had ordered the shooting of protesters. But during ’68 at least 2 people were shot dead by the cops towards the end of the movement (and several others either disappeared or turned up to have apparently died in car accidents). Moreover, in 1961, also under de Gaulle, something like 200 Arabs were killed, most of them thrown into the Seine. And in ’86 an Arab was killed by the cops, though not shot. But for the daughter of the torturer of Algerians, these incidents are obviously irrelevant. 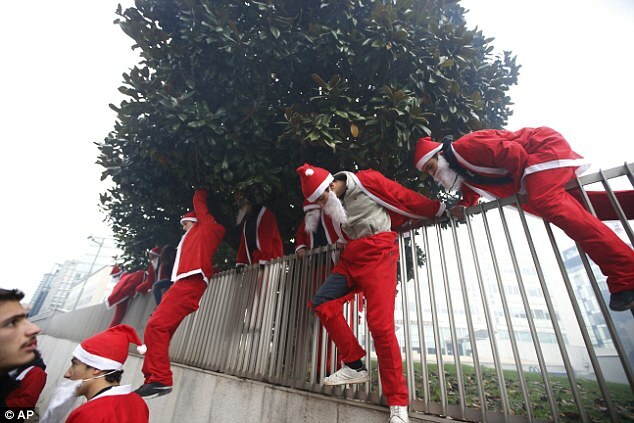 See this Crimethinc article for an account of the day.